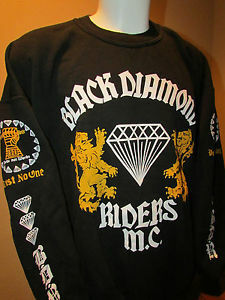 The Black Diamond Riders M.C. The telephone rings. The nice policeman on other end of the line informs you that “SOMEONE’S BREAKING IN TO YOUR CAR! YOU’D BETTER COME DOWN AND CHECK IT OUT”! You throw on your winter boots and jacket. You unlock the dead-bolt and as the door opens, four 350-pound paramilitary goons come crashing in to your apartment. One of the goons grabs you by the throat and slams you to the floor, breaking several ribs as he lands full-weight on your chest. An M-16 rifle is pressed against your head. It’s a police raid and they have come for your perfectly LEGAL guns. 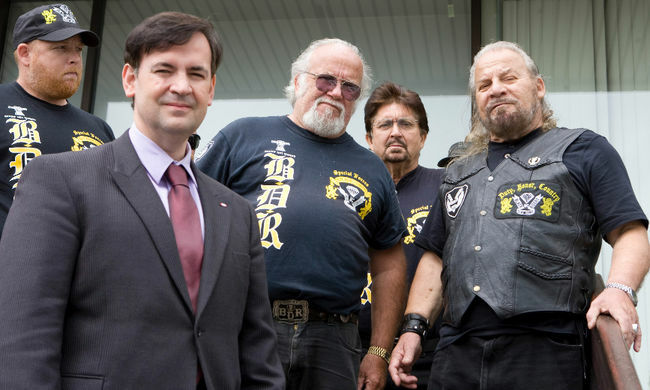 Just another day in the life of Johnny Sombrero, founder and leader of the Black Diamond Riders Motorcycle Club. But we’ll return to the scene of the crime later. The legend of Johnny Sombrero spans sixty-plus years since the formation of the Black Diamond Riders in 1950. Many ‘long-time’ Canadians will remember the stories from their youth about Johnny and his hard-driving, fast-living cadre of bikers. Their antics shocked the stoic Toronto of the 1950’s. The sound of thundering motorcycles and their often rowdy behavior challenged the sensibilities of a city whose stores were closed on Sundays. In the 50’s, the city was more akin to a little piece of Scotland than the major North American city that it is to-day. Toronto the Good is where the legend of Johnny Sombrero was born. Now…back to the 2010 raid. When we last left Johnny he was on his apartment floor after Officer Friendly had broken a few of his ribs. Probably not a good thing after recently having triple by-pass heart surgery. You’d think that the nightmare would be coming to an end, but the state-sponsored terrorism was just beginning. After the 350-pound storm-trooper pushed down on Johnny’s throat to push him self up, he pulls Johnny to his feet. With the victim now standing, his arms are almost ripped out of their sockets as they are forced behind his back. The seventy-six year old leader of the pack is then violently lifted and then dropped by his arms in that position not once, not twice, but thrice. More injuries ensue as the torturers continue to have a good old time. The ‘flash-eliminator’ on the end of a sub-machine gun remains practically glued to his head. As the men-in-black search the apartment, the reportedly idiotic looking women-in-black were relegated to packing the apex B.D.R.s PERFECTLY LEGAL GUNS into boxes. After a thorough frisking, a disappointed searcher yells out, “He doesn’t have a gun on him!” Let’s take another break from this horror show. Johnny’s father, originally from Carlyle in England, bought his son his first gun when he was seven years old. Although this may sound unusual to-day, it certainly wasn’t unusual then. Keep in mind; this is when the T.T.C. fare was three cents. Of course, dad wasn’t too pleased when young Johnny blasted a hole in the furnace, but boys will be boys. In grades seven and eight at King George Public School everyone carried a knife. Even his teacher, Mr. Bissell kept a blade close at hand. It wasn’t even unusual to carry a gun on to the street car back in the day. But let’s pick up from where we left off, describing the raid of Thursday, January 21st, 2010. Did we mention that it took four squads comprised of ninety commandos to take down a single Canadian citizen? Almost one commando per gun. Now hand-cuffed with his hands behind his back and through the rungs in the back-rest of the chair, Johnny now had a g8 rifle closer than an inch from his brain. According to Johnny, the g8 rifle is a cheap Canadian knock-off of the M-16 a1 colt which is the Real McCoy. Nevertheless, it is still capable of firing seventeen rounds a second. He suggested that keeping the firearm pointed at his head while he is already secured is unsafe and unnecessary. In the last several decades society has been witness to more and more cowardly over-kill by law enforcement in general. One participant present during our interview felt that they are no longer cops once they are issued automatic weapons. They become a paramilitary unit and are psychologically obligated to kill and maim. After ordering ten pizzas to make it a real rockin’ party, they couldn’t even offer Johnny some food. They KNEW he had diabetes, but it’s their unique idea of fun. They were also planning a future party to shoot his Thompson sub-machine guns and liberate some of his ammo. That party was also a real ‘happenin’. Anyway, Johnny realized that something was out-of-sync when a Crown Attorney, who was some kind of primate in a suit, entered the apartment. This is so contrary to protocol that it’s fascinating. It’d just not done. After being held at gun-point for five hours, he was charged with eighteen counts of careless firearm storage for leaving the bolts inside his machine-guns. This was despite the fact that the weapons were safely stored in lockers. All Johnny’s weapons were confiscated. Can you guess what the eventual outcome of this case was? We’ll get to that now, because most courtroom activity is boring and we don’t have all day. The Crown Attorney that had improperly entered the apartment on the day of the raid had to excuse himself from the case. It was handed off to a female Crown. The rather pleasant judge was also female. The lone Defense witness, who is a gun expert of some note, testified that Mr. Sombrero met or EXCEEDED the requirement of safe storage laws. The Crown’s witnesses should have been home lying in bed, because their lying in court didn’t help the Crown. “BOTH OF THE LOCKERS IN WHICH THE PROHIBITED FIREARMS WERE STORED WERE MADE OF STEEL. EACH CABINET WAS SECURELY LOCKED. THE CROWN HAS NOT PROVEN BEYOND A REASONABLE DOUBT THAT THERE WAS NON-COMPLIANCE WITH THE REGULATION”. Justice Brewer then dismissed the case. The Crown Attorney slammed her pile of documents down on the prosecution table and huffed, “I’ll never take over a case from another Crown Attorney again.” After the positive decision, Johnny Sombrero rightfully had a lot to say. “YOU’RE DAMN RIGHT I’M PISSED-OFF! THEY’VE HAD MY PROPERTY FOR SEVENTEEN MONTHS AND THIS IS THE TWENTY-FIRST TIME I’VE BEEN TO COURT! MY DAD GAVE ME MY FIRST GUN WHEN I WAS SEVEN-YEARS-OLD, A .22, AND THE POLICE HAVE IT RIGHT NOW”. Some have suggested that envy by the police helped motivate some of the unnecessary violence against Johnny. He’s a legend. They are nameless drones. There are but a few Canadians that have achieved legendary status. Johnny Sombrero is certainly one of them. A colorful person stands out in a country where grey is the dominant color of the landscape. An article like this one barely scratches the surface, but is only a small sample of the life and times of Johnny Sombrero. The man, the myth, the legend. It is amazing how much bull you can not only stomach, but also regurgitate. There is no doubt??? None what so ever! What criminal activities have you commited in the past, what are your secret crimes??? Jaywalking? Smoking some herb? Stealing candy from the neighborhood mini-mart as a kid? Obviously you know nothing about the trials and tribulations of Johnny Sombrero, and there is also obviously no doubt about YOUR criminal activities! Are the chartered accountants at Laberge Venne former crown attorneys? Seems you lost your case considering Johnny Sombrero’s recent charges were for NOT breaking ANY law. In fact the only criminal activities were committed against Mr. Sombrero. Theft of private property, invasion of privacy, assault and false arrest. It is obvious Johnny Sombrero is a victim of criminal activities; just as it is obvious you are bigoted against freedom loving motorcycle exhausts. I found this article to be absolutely amazing. I guess it answers the question as to how many morons it takes to subdue one man. I remember Johnny from my youth. As well as many members of the BDR’s, having had most of them in our home at one point or another. Granted, they could be a rowdy bunch, but from my memories, they were always pleasant and respectful of my mother and us kids. I think of you often Johnny, and talk of you many times when talking to friends in The Big Red. Hi Johnny I was wondering if you know or knew my brother Ed he lives in North York I am his older sister Linda I hate what the cops did to you. Linda, I am not sure if you know of this site with regards to the BDR. You may find it interesting to browse through. This is a site spanning over 40 years of pictures of the BDR’s. You may very well see your brother in there. Or perhaps people you have know,. Here is the link to the site. Just a comment for Anonymous. First off, I personally pay no attention to anyone that posts as anonymous. Hiding that way shows a definite lack of accountability. I will tell you this, you have no idea what you are talking about. What they did to Johnny was wrong on all levels. They did not go after him for any past issues. I am assuming you do possess the ability to read, but I am concerned as to whether you have the ability to comprehend what you read. From my viewpoint, you do not. May I suggest you re-read the articles pertaining to his illegal arrest, and the flagrant disregard for the rights that were totally ignored by Toronto’s finest. (Excuse my while I choke on that one). May I also suggest that you grow yourself a set, and maybe then you will not see the need to hide behind anonymous. It was cool looking at all the pictures I did see some that looked like people I knew but I’m not sure. My name is Linda Lavelle Lozon I sent two posts to you but I used my maiden name on one @ my married name on the other I just wanted to let you know. Do the names Norm Scott or Marie White ring a bell? My brother Ed Lavelle said Johnny still lives in North York. I am not sure about that. Last I heard, he was in Scarborough. Oh I’m sorry I thought my brother said he was in North York that’s what happens when we are in our late 60s . My other brothers Bill @ Danny have both passed away but were members of the Paradice Riders. Sorry to hear about the passing of your brothers. Hi I think my brother and his wife went to a barbeque at johhnys 2 years ago in the summer . no I have never heard of Norm Scott or Marie White why who are they ? my uncle Robert McCallum used to tell stories about when he was a Black Diamond Rider and how much he respected Johnny a great deal .what I want to know is if Johnny remembers him or not ? Can anyone tell me if they know Robert McCallum as a BDR or not ? Yes, a bunch of the older members are still around. And they still get together quite often. There is no police force in Canada that uses the G8… So how much of this is actually true? l came across this and enjoyed this story very much although it did make me see red at how this man was treated by the police disgusting,abusive and just wrong. When l was a young girl back in the 70’s my gf and l were hitchhiking up Markham Rd in Scar. We were picked up by a guy who said his name was Joe but his friends called him Little Joe and he was in the BDR,he also went on to give us hell on the dangers of hitch hiking. Joe dropped us off at my parents and we agreed to meet up,we became fast friends Joe and l,he was such a gentleman,so good to me and always respectful to my family. l remember one time he told my mother “you don’t like me” and my mother was shocked and told him no that was not true at all….lol. Joe and l remained friends for a long while and when l married he came by to make sure l was happy(he was’nt happy with my choice) but eventualy stopped coming around. l believe he meant a girl. l loved that man for his goodness,his kind heart and just being my friend when l knew he wanted more. l have never stopped thinking of him and l often wonder how he is. l did hear he has been ill and l just wish someone could tell him l am keeping him in my prayers…thanking you in advance LeeAnn Connolly . My name is Patrick Doyle. My Father Phil Doyle was a member of the club. After the divorce I lost touch with Phil. I am looking to contact him. Does anyone know Phil Doyle? It’s nice to see this forum is still going strong. Not sure if you are still following this forum Linda, but if you are, a long overdue hello to you. I am sorry Patrick, but I can’t really say as I do. Back when club members were a part of our lives, I was just a kid. How do I get in touch with Johnny Sombrero? John email me please. I am not sure Patrick. I have his old number but do not have his recent one. I will see if I can find it for you. But I will call him first before giving it to you. Thank you very much. Did you know Phil Doyle? I am sorry, but no I don’t. Can someone tell me, is Johnny still around? We heard he had passed. My husband knew him way back when. We are not in Ontario anymore so news doesn’t really get out this way. As far as I know, Johnny is still among the land of the living. I believe he is living in Scarborough at present. Although I am not sure of his address now. Angela, You couldn’t have said it any better than I could have. Unfortunately there are those among us that can’t read, and if they can, they only take what they want to read from what the do read. People spouting about about things they don’t know is a real pet peeve of mine too. Although I was a kid when I knew Johnny, I always felt safe around him and the rest of the club members. As did my Mother, aunts, neighbours, etc. It was a pretty common scene to see a dozen or so bikes on our front lawn every weekend. How many of them did you get to meet? I met quite a few of them when I was young. I honestly don’t know how many. Funny thing, perhaps. J. Sombrero has never been convicted of any offence. He has no criminal record. Nothing. I wonder was a law suite filed due to this behaviour of the law? LTR. My husband was known as “DOC” during those days and helped the injured. Now, to this date he has been shunned by everyone, even doctors, they won’t help in his need. I feel for Jonny Sombrero for my husband had the greatest admiration for him. Sorry to see this John, I hope you spit in their eye! Those that really knew Johnny back then will tell you, he really did have a heart of gold. Maybe someone can steer me in the right direction. I seem to have lost the link to the site that had hundreds of pictures of club members, family members and friends. Pictures of Johnny when he was in his 20’s, etc. Pictures of original BDR’s. Clubhouse pictures, etc. Does anyone know if the site was taken down? Johnny -Chow from another person knowen by you in Oshawa,On. I ran into joe fortunato to-day and was advise of his passing. I go way back to the mid 50’s when i first met johnny in their hangout on queen st. Had a hell of a time getting to the back of the restaurant to have a sit down with him. I was president of the Queen city Monarchs. We had 20 members and hung out at bathurst and bloor st. We wanted to be patched by the BDR for safety reasons. he agreed and we paid $25.00 for each member.This was a deal and meant a lot to us to have this safety net and not be bothered by any one. johnny use to come to orangeville a lot to visit one of our neighbors. never went over there but did run in to him at canadian tire, he remembered me and we had a good conversation about the old days. he also told me that he was starting up the BDR’S again. My response was at our AGE…LOL If you new him he was like a god that you could trust. back in the 50’s i wore a silver jacket with a large lion on the back. My name back than was conchow . RIP JOHN WILL SEE YOU WHEN ITS MY TIME. tHANKS TO JOE FOR LETTING ME KNOW. I grew up on Lippincott Street during the 1950s. There was a Harley Davidson shop on College street just next to Bathurst street. This shop was always full of BDRs. They were always super nice to neighbourhood kids. A great bunch of guys. RIP Johnny. Anyone recognize the name ‘Rick Plane’? Hi all and hope you all have a Merry Christmas..I am still trying to find a working link to all the great pictures that were posted ? I grew up in Rexdale and knew Fred Markham very well. There was a site with hundreds of pictures of the club but I haven’t been able to find it for over a year now. The site was either taken down, or moved. I would love to find that site again. Any idea where I can get this shirt?